It’s that time of year again, when the whole racing world stops and turns its gaze to Prestbury Park in anticipation of the greatest racing Festival: Cheltenham. Every race is dissected and discussed in detail, every horse has their attributes examined and every racegoer anticipates a week to remember. Memories of previous Festivals are also often brought up. The champions of yesteryear and their efforts in victory- or defeat- are fondly compared to the current generation of horses, while the great rides and training feats of legendary jockeys and trainers make regular reappearances in conversation. The Museum is getting caught up in the excitement as well, and everyone has their own particular recollection of the Cheltenham Festival. 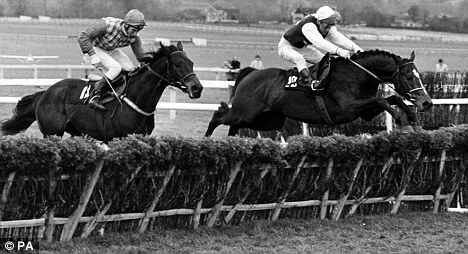 Alan, our Assistant Curator, remembers the build up before the legendary 1964 Cheltenham Gold Cup when he was a child; how excited everyone one was and how confident they were that Mill House would triumph, only for him to be blown away by the mighty Arkle. Tim Cox, one of our Trustees, treasures the memory of the 1979 Champion Hurdle, when game little Monksfield outfought Sea Pigeon up the hill for his second win in the race. Tim had seen Monksfield at Leopardstown earlier in the season, and recalls that he placed his only ante post bet on the horse afterwards. The photos from the race are still hanging up in his house. More recently, Roz, our Campaign Manager, remembers the excitement and anticipation of the match between Kauto Star and Denman before the 2008 Gold Cup (hard to believe that was five years ago), when that pair of legends held the racing world captive for months before the Festival. My own favourite memory is also recent: the Cheltenham Gold Cup in 2009 when Kauto Star made history by regaining the crown, and Denman showed he was back from his heart problems with a fantastic effort in second. It was simply a fantastic race to watch. For us, as I’m sure for many others, it will take a lot to replace those memories as our defining Cheltenham memories, but with the presence of Sprinter Sacre, Hurricane Fly and Simonsig as well as many others, once again this year’s Festival promises to be one remember. What is your favourite Cheltenham Festival memory?